WiFi Surveyor offers a variety of diagnostic views of the data captured by the RF Explorer device. Employing multiple views of the data enhances your ability to gain a better understanding of the local, RF landscape in which your wireless network is operating. 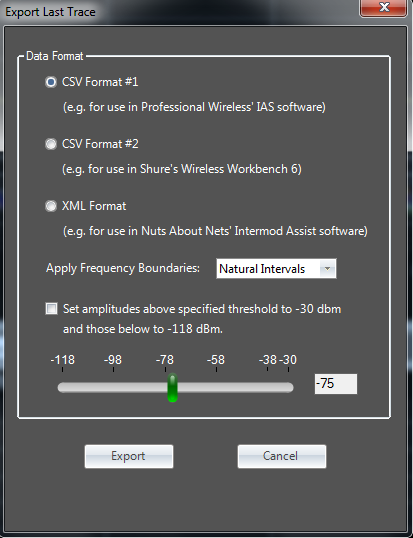 WiFi Surveyor includes two software modules integrated into one application — one for RF spectrum analysis and a second for performing 802.11 network discovery (i.e. Wi-Fi scanning). Armed with the information these tools provide allows you to make better decisions setting-up, configuring and maintaining your wireless network. Also, if a wireless network is performing poorly then WiFi Surveyor can aid in troubleshooting the problem and help you determine whether other wireless devices operating in the vicinity are the source of RF interference. Optimally installing and maintaining wireless networks. Troubleshooting poor-performing wireless networks by detecting the presence of RF interference. As an aid in properly locating wireless devices so as to maximize range and throughput and minimize interference from competing wireless devices. As a learning tool to help understand the relationship between access points (BSSIDs), wireless networks (SSIDs), and Wi-Fi RF transmissions. For certain charts, WiFi Surveyor massages the raw, RF energy data to create “channel-centric” diagnostic views. In contrast to a typical spectrum trace that plots signal strength along the y-axis and frequency along the x-axis, a channel-centric chart replaces frequency with 802.11 channels along the x-axis. The 802.11 network discovery charts are similar in appearance but use different data and have a different interpretation. 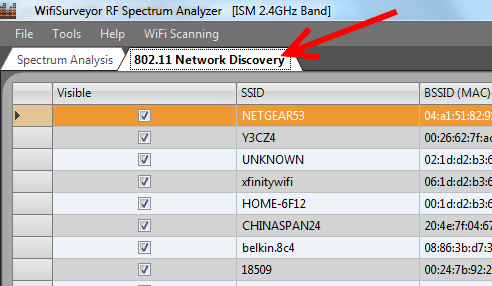 It is important to clarify the distinction between RF spectrum analysis and 802.11 network discovery — in RF spectrum analysis a radio module is measuring raw, RF energy across a frequency range, whereas in 802.11 network discovery your laptop’s built-in 802.11 adapter decodes beacons received from nearby wireless routers. The channel-centric views are calculated by summing all the RF energy for the range of frequencies that fall under each channel. Since Wi-Fi channels overlap then the RF energy detected for a particular frequency will contribute to more than one channel. Contrast this with 802.11 network discovery, where the 802.11 adapter only sees 802.11 beacons — it does not see raw RF energy. So, when viewing the charts it is important to keep in mind which data is being used — raw, RF energy or 802.11 beacons. 1) Before beginning the installation it will be necessary to download the latest version of the WiFi Surveyor application. Also, if you have not already done so, it will be necessary to attach an RF Explorer spectrum analyzer to the PC via USB cable. 3) Run the installation / setup program and follow the prompts for installing the application. Be sure to review the License Agreement as you progress through the installation procedure — each license key can be used to install the software on a single machine. When the Setup Wizard has completed then click the ‘Finish’ button. Please note that in addition to the application, the installation program should also install USB drivers from Silicon Labs. By default the application is installed in the folder ‘\Program Files (x86)\NutsAboutNets\WifiSurveyor’ and a desktop icon is created. 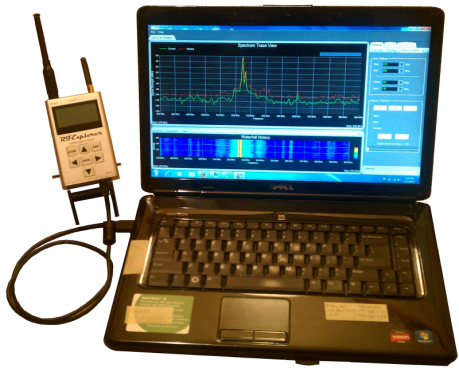 4) Attach an RF Explorer spectrum analyzer to your PC using a USB-to-PC connection cable. Alternatively, if you do not have an RF Explorer device it is still possible to run the application in a fully-functional ‘Demo Mode’ using simulated data. 5) WiFi Surveyor requires a license key (i.e. activation or registration code). The first time the application is launched you will be prompted to register the application. When the software was purchased you should have received an email with your license key. To register the program enter your email address (the one used when you purchased the software) and the license key you received by email. 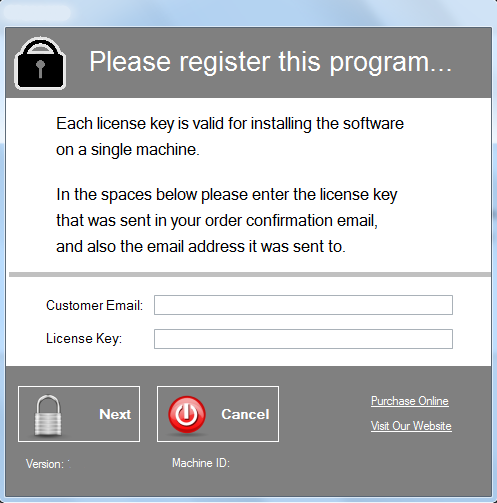 If you have not yet purchased a license key you can still evaluate the software by running in “demo” mode. 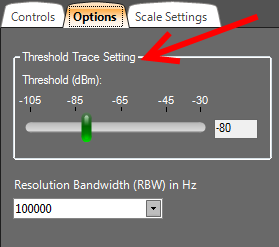 To run in “demo” mode launch the application without an RF Explorer spectrum analyzer attached to your PC. The Start and End frequencies define the boundaries of the RF spectrum trace when the analyzer is scanning and measuring RF energy across a frequency range. The frequency settings are always specified in units of megahertz (MHz). 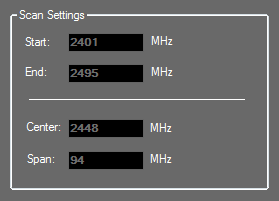 When scanning the 2.4x GHz ISM band the frequency range is fixed at 2401 MHz to 2495 MHz. 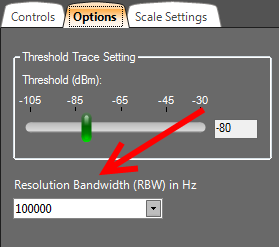 When scanning the 5.x GHz ISM band the frequency range is fixed at 5100 MHz to 6100 MHz. 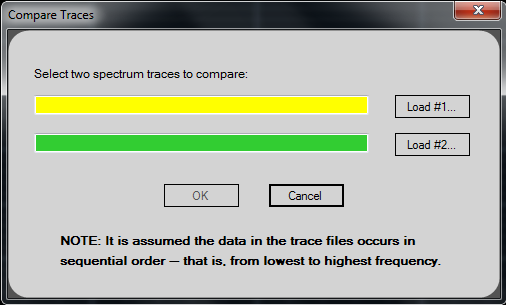 The Vertical Scale slider controls the height of the Y-axis in the Spectrum Trace view. By default it is set to -30 dBm (the maximum value). If the signal strengths are low then decreasing the Vertical Scale has the effect of “zooming” the trace views. This has no effect on data acquisition — only on how the data is displayed. 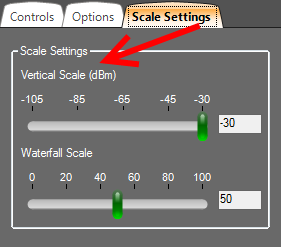 The Waterfall Scale slider control applies only to the Waterfall chart. This control can be used to rescale and remap the signal strengths to better spread them across the range of colors that are used (see legend to the right of the Waterfall chart). 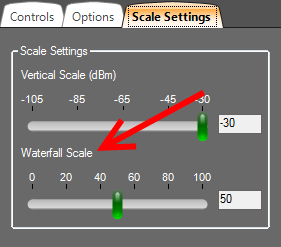 This is useful when all the signal strengths are large and the Waterfall chart appears mostly red or when all the signal strengths are low and the Waterfall chart appears mostly blue. For the best visual effect, ideally you’d like the peaks (strong signals) to appear red and the valleys (weak signals) to appear blue. But sometimes even the valleys have large signal strength values or the peaks have low signal strength values. This control is useful in remapping the color legend to better make use of the colors and how they are spread across the peaks and valleys of the signal strength values. 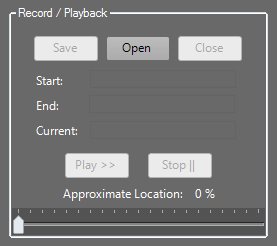 IMPORTANT: The file used as a reference trace must have previously been saved using the ‘Export Last Trace’ feature (see above). Similar to the Spectrum Trace view — used to monitor and display RF signal transmissions as a function of frequency. However, in addition, this chart highlights with a yellow box those frequencies whose signal strength exceeds a user-defined threshold. This feature is especially useful for visually emphasizing strong signals (and deemphasizing weak ones), where the user gets to define ‘strong’ and ‘weak’ according to where they set the threshold. A “channel-centric” chart — similar to the Waterfall History chart above — the difference being that here we plot channels rather than frequencies. That is, along the X-axis we have channels, the Y-axis is a time scale, and the “Z-axis” is the color scale. Each horizontal line in this chart displays the accumulated signal strength (as a color) of all the frequencies that are included within the channel band as measured over the time period of one scan. That is, with each scan (or sweep) a new row is added at the bottom of the chart for each channel. The color legend to the right shows that stronger signals will appear red and weaker signals will appear blue. For “channel-centric” charts, the signal strengths of all frequencies used by a particular channel are summed, normalized and reported as one value. A “channel-centric” chart — displays a three-dimensional plot of channels as a function of time. Each channel is represented by its own set of bar graphs — the Z-axis is time and the Y-axis is signal strength. As with the Channel Timecourse chart (below), this view makes it easy to visualize how RF interference affects different channels over time. For “channel-centric” charts, the signal strengths of all frequencies used by a particular channel are summed, normalized and reported as one value. A “channel-centric” chart — similar to the Topographic chart above — the difference being that here we plot channels rather than frequencies. A signal strength that appears with a relatively low occurrence is ‘blueish’ in color, whereas increasingly brighter colors are used for signal strengths that occur more frequently. Signal strengths that occur most often are ‘reddish’ in color. Another way of stating this would be to say this chart uses color to mark the rate of occurrence (i.e. how often) a particular signal strength occurs. For “channel-centric” charts, the signal strengths of all frequencies used by a particular channel are summed, normalized and reported as one value. A “channel-centric” chart — useful for monitoring channels as a function of time. Each channel is represented by a different line — the X-axis is time and the Y-axis is signal strength. In this way one can clearly follow how RF interference affects different Wi-Fi channels over time. For “channel-centric” charts, the signal strengths of all frequencies used by a particular channel are summed, normalized and reported as one value. 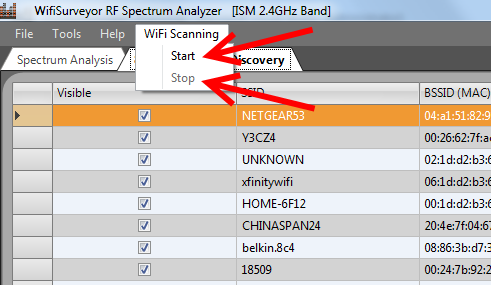 The Network Discovery charts are accessed by selecting the tab ‘802.11 Network Discovery’, and Wi-Fi scanning is toggled ON / OFF by selecting ‘Start’ or ‘Stop’ from the ‘WiFi Scanning’ drop-down menu. Please note that 802.11 Network Discovery is disabled during RF Spectrum Analysis, and vice-versa. This grid of local access points (APs) is updated in (semi) realtime — that is, scans are performed approximately once every 5 seconds. Site survey of local access points (APs). The height of each elipse reflects the strength of an AP’s beacon and NOT data throughput. The strength of an AP’s beacon is an indication of how far away the AP is located from the point of measurement. Displays the beacon strength of each access point as a function of time. The Y-axis reports the signal strength as a signal quality (0 – 100%) — where a maximum signal is assumed to be -20 dBm and the dissociation signal is -85 dBm (http://www.ces.clemson.edu/linux/dbm-rssi.shtml). We find this more intuitive than reporting a RSSI in dBm or mWatt. If you would also like to know the signal strength in dBm then this is reported in the grid above the chart. Displays the current beacon strength of each access point compared with an earlier snapshot. The current beacon strength is displayed in green, the snapshot in light-blue, and the difference in gray. The Y-axis reports the signal strength as a signal quality (0 – 100%) — where a maximum signal is assumed to be -20 dBm and the dissociation signal is -85 dBm (http://www.ces.clemson.edu/linux/dbm-rssi.shtml). We find this more intuitive than reporting a RSSI in dBm or mWatt. If you would also like to know the signal strength in dBm then this is reported in the grid above the chart. This display can be used to view small (or large) changes in beacon strength over time. Here’s how it works — when the scanning first begins then a ‘snapsot’ of the beacon strengths are taken — these are the light-blue bars. These bars are static and do not change. The green bars show the current beacon strengths, and the gray bars are the difference between the snapshots and the current beacons. Combines the access points by channel and displays a summary of channel usage. The Y-axis reports the signal strength of beacons as a signal quality (0 – 100%). In this view the data for each channel represents a collection of access points — hence the signal quality as displayed along the Y-axis is often greater than 100%. This is because we are summing the signal qualities for each of the access points that use a particular channel. One thing important to keep in mind is that beacon signal strength is not a reflection of performance — rather, it is an indication of how close an AP is located to the point of measurement. Combines the access points by channel and displays a summary of channel usage as a function of time. The Y-axis reports the signal strength of beacons as a signal quality (0 – 100%). In this view the data for each channel represents a collection of access points — hence the signal quality as displayed along the Y-axis is often greater than 100%. This is because we are summing the signal qualities for each of the access points that use a particular channel. One thing important to keep in mind is that signal strength is not a reflection of performance — rather, it is an indication of how close an AP is located to the point of measurement. Combines the access points by channel and displays a summary of channel usage as a Heatmap. The Heatmap chart is also known as a “waterfall” graph. It is a 3-dimensional representation of the data, where the X-axis is the channel, the Y-axis is a time scale, and the “Z-axis” is the beacon signal quality that uses a color scale. Each horizontal line in the Heatmap chart displays beacon signal strength (as a color) as a function of channel as measured over the time period of one scan. That is, with each scan (or sweep) a new row is added at the bottom of the Heatmap chart. The color legend to the right shows that stronger signals will appear red and weaker signals will appear blue. A three-dimensional view of channel usage as a function of time. Each channel is represented by its own set of bar graphs — the X-axis is the channel, the Z-axis is a time scale, and the Y-axis reports the signal strength of beacons as a signal quality (0 – 100%). In this view the data for each channel represents a collection of access points — hence the signal quality as displayed along the Y-axis is often greater than 100%. This is because we are summing the signal qualities for each of the access points that use a particular channel. One thing important to keep in mind is that signal strength is not a reflection of performance — rather, it is an indication of how close an AP is located to the point of measurement. Except where otherwise noted, all of the documentation and software included in the WifiSurveyor software package is copyrighted by Nuts About Nets, LLC. This Nuts About Nets, LLC End-User License Agreement (“EULA”) is a legal agreement between you (either an individual or a single entity) and Nuts About Nets, LLC for the WifiSurveyor – RF Spectrum Analyzer & Network Discovery software product identified above, which includes computer software and may include associated media, printed materials, additional computer software applications, and “online” or electronic documentation (“SOFTWARE PRODUCT”).